Gylfi Sigurdsson’s goal – after a long spell of possession, Allen’s shot is deflected, and laid back into the path of Sigurdsson by Graham. He hits his shot firmly into the ground, and it finds the far corner. 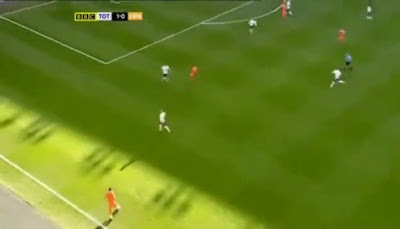 For long periods of the game, Spurs pressed all of the Swansea team except for Monk, although on this occasion Williams is allowed to push forward with the ball. He finds Scott Sinclair who, as is often the case, looks to drive inside. Van der Vaart comes out to meet him, but he skips past him, dragging Sandro across. Sinclair lays off to Allen, taking Sandro out of the game. Parker reads this relatively well, and starts making a move across to block any potential shot. Note Modric’s position, though – the most advanced Spurs player in the image above. Also note Sigurdsson, the eventual scorer. Modric has not tracked his man, and has not anticipated the danger of Sandro and Parker having moved out of position. Modric still fails to move as the ball loops up to Routledge. Routledge has the strength to hold off Assou-Ekotto and the intelligence to tee up Sigurdsson, unmarked on the edge of the box. …although he hits his shot into the ground, it bounces beyond Friedel’s reach, and finds the top corner. Swansea’s attacking game is built on keeping the ball and creating 3 vs 2 and 4 vs 3 situations in different areas of the pitch, but particularly in this central region. Sigurdsson has profited many times already for them in his short spell, often finding the ball at his feet in this sort of region due to their wingers cutting in and creating an extra man in a more central area. This time, both wingers cut in, and two of their three central players are well forward and looking to get shots away. 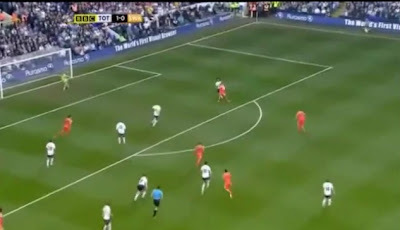 Walker is occupied with Taylor making a run in behind, and when Sinclair beats his man (vdV), Sandro has to come across and they take advantage of their sudden extra man well – albeit with a bit of luck from the deflected Allen shot. Sigurdsson is only just gaining recognition for being a fine goal-scoring midfield player. He was excellent for Reading last year, and I was very surprised when a Premier League club didn’t take a chance on him – Hoffenheim eventually signed him for £6.5m. Rodgers had worked with Sigurdsson at Reading, so obviously knows him well – perhaps he will sign up up permanently this summer (could that be for Spurs?!). If you liked this, you should definitely check out ZonalMarking.net. They scored then........................thanks for all them shots and explanation but I watched on the box. Your detail is brilliant, I have always skimmed past this article before, but it was a great read. Keep it up! Appreciate your comments, cheers! Reckon I should try for a more snappy title to grab your attention next time?! Ignore the 2 morons, this is a good blog and the attention to detail is admirable. Keep it up. Cheers. Agreed. Interesting to always see the analysis. I was referred here by CartilageFreeCaptain - good stuff, think I might subscribe now! Thanks. Nice one, good of CFC to link to me. Thanks for your comments. 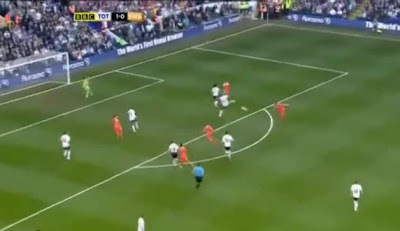 I reckon the goal was due to Kaboul closing down Sigurdsson too slowly, not the fact that modric wasn't tracking him. He was a little slow out, but had no protection. Agree with you on Kaboul, he was generally a rock, and in this instance, caught in a position that pushing out to the player could have caused as much a problem as not. It was a chance on goal whichever he did. One worry about him was his and benny's communication when pinned in the corner and looking to clear, a few times the pair of them looked lucky to get away with conceding throw ins. But a minor grumble after the weeks we have had, I shan't hold it against them for one match. As ever, a fair and constructive disection of events, keep it up.